Yavalath is a game by Cameron Browne and is played on an empty hexagonal board. Yavalath is a game that has been invented by a computer program. The objective is to make at least 4 stones of your color in a row without making first 3 stones in a row. Starting with white, players take turns placing a stone of their colour in any empty cell on the board. Since the first player has an advantage, the game has a 'pie rule'. 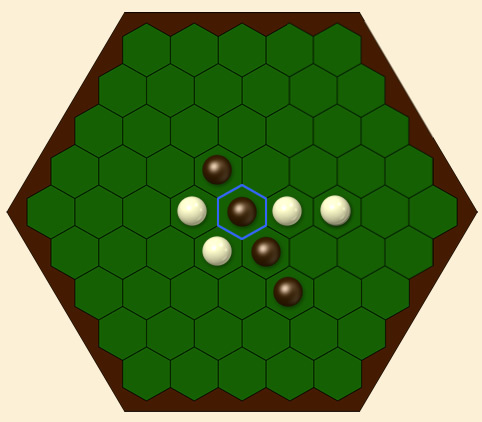 On his first move, black may choose to swap colours: either black places a stone on a empty spot and the game continues normally or he clicks on the first white stone, indicating that he wants to swap color and continue as white. The player that makes 3 in a row (without making 4 in a row on the same move), loses the game. The player that first makes 4 (or more) in a row, wins the game. You are not allowed to pass. It's a draw when the complete board fills without a winner. Below a game where black has to make 3 in a row to avoid the 4 in a row for white. Black loses. Below black gets 4 in a row and wins.